Pragmatism originated in the Cambridge, Massachusetts area in the 1870s with the Metaphysical Club. Charles Peirce and William James taught pragmatism at Harvard University during the 1890s and early 1900s, and pragmatism has been vibrant there ever since. John Dewey forged his pragmatism with George Mead at the University of Chicago in the 1890s, and then Dewey led a third center of pragmatism at Columbia University during 1905-40. All branches of pragmatism can be traced back to philosophers from one of these three original schools. Many of the philosophers who founded pragmatism, or defended their own versions of pragmatism, have been closely associated with Cambridge, Massachusetts, and Harvard University. During the "Golden Age" of American philosophy, the most important Cambridge pragmatists were Charles S. Peirce (M.A. Harvard 1862, professor at Johns Hopkins, and occasional lecturer at Harvard), and William James (M.D. Harvard 1869, professor at Harvard). According to Peirce, pragmatism was born in the discussions of the Metaphysical Club in Cambridge during the early 1870s with inspiration from positivist Chauncey Wright (B.A. Harvard 1852, occasional Harvard lecturer) and legal realist Nicholas St. John Green (L.L.D. Harvard 1861). Two more Harvard professors were heavily influenced by pragmatism: the pragmatic idealist Josiah Royce (professor at Harvard) and and the pragmatic naturalist George Santayana (Ph.D. Harvard 1889, professor at Harvard). Among the many students who received their degrees with this philosophy faculty, some became pragmatists in their own right, including John E. Boodin (Ph.D. Harvard 1899, professor at University of California, Los Angeles), Edward O. Sisson (Ph.D. Harvard 1905, professor at Reed College), Horace M. Kallen (Ph.D. Harvard 1908, professor at University of Wisconsin and The New School for Social Research), and Clarence I. Lewis (Ph.D. Harvard 1910, professor at Harvard). Associated with the Cambridge philosophers are Oliver Wendell Holmes Jr. and W. E. B. Du Bois. Holmes (B.A. Harvard 1861) was a member of the Metaphysical Club in the early 1870s with William James, Charles Peirce, and other Cambridge intellectuals, where he heard Peirce expound his pragmatism. Holmes, later a Supreme Court Justice, is regarded as the first legal pragmatist who understood the law in terms of the practical consequences of the judicial system. Du Bois (Ph.D. Harvard 1895, professor of economics and history, and later chair of the sociology department at Atlanta University) became the first African American to receive a Harvard Ph.D., having studied with William James. His social philosophy and political activism is often classified as pragmatic in spirit. Pragmatism continued to flourish at Harvard University, home to two of the most prominent pragmatists active during the mid-20th Century: Clarence I. Lewis (Ph.D. Harvard 1910, professor at Harvard), and W. V. Quine (Ph.D. Harvard 1932, professor at Harvard). The philosophy department produced many more contributors to the pragmatic tradition, including Alain L. Locke (Ph.D. Harvard 1918, professor at Howard University), Wilbur H. Long (Ph.D. Harvard 1927, professor at University of Southern California), Paul Weiss (Ph.D. Harvard 1929, professor at Yale University), Harold N. Lee (Ph.D. Harvard 1930, professor at Tulane University), Otis H. Lee (Ph.D. Harvard 1930, professor at Vassar College), Donald W. Meiklejohn (Ph.D. Harvard 1936, professor at Syracuse University), David Savan (M.A. Harvard 1939, professor at University of Toronto), Thelma Z. Lavine (Ph.D. Radcliffe College 1939, professor at George Mason University), Samuel S. S. Browne (Ph.D. Harvard 1944, professor at University of Cincinnati), Paul G. Kuntz (Ph.D. Harvard 1946, professor at Emory University), Robert E. Dewey (Ph.D. Harvard 1949, professor at University of Nebraska), Richard S. Robin (Ph.D. Harvard 1957, professor at Mount Holyoke College), John F. Boler (Ph.D. Harvard 1960, professor at University of Washington), Chung-Ying Cheng (Ph.D. Harvard 1964, professor at University of Hawaii), William D. Stine (Ph.D. Harvard 1969, professor at Wayne State University), and Roy C. Weatherford (Ph.D. Harvard 1972, professor at University of South Florida). Morton G. White (Ph.D. Columbia 1943, professor at Harvard) and Israel Scheffler (Ph.D. Pennsylvania 1952, professor at Harvard) promoted interest in pragmatism through philosophy and philosophy of education. In 1976 Hilary Putnam (Ph.D. UCLA 1951) arrived at Harvard. Recent graduates include Karen Hanson (Ph.D. Harvard 1980, professor at Indiana University, Bloomington), Henry S. Richardson (Ph.D. Harvard 1986, professor at Georgetown University), Miriam Solomon (Ph.D. Harvard 1987, professor at Temple University), Jerome P. Soneson (Ph.D. Harvard 1990, professor at University of Northern Iowa), James Conant (Ph.D. Harvard 1991, professor at University of Chicago), Harvey J. Cormier (Ph.D. Harvard 1993, professor at SUNY at Stony Brook), and David C. Lamberth (Ph.D. Harvard 1994, professor at Harvard Divinity School). Scheffler retired in 1992, and Putnam retired in 2000. Peter Godfrey-Smith has taught at Harvard since 2003 and includes pragmatism among his interests. John Dewey founded the Chicago School of Pragmatism during his ten years at the University of Chicago, from 1894 to 1904. The original group included his philosophy colleagues: George H. Mead, James H. Tufts, James R. Angell, Edward Scribner Ames (Ph.D. Chicago 1895), and Addison W. Moore (Ph.D. Chicago 1898). Jane Addams, the Founder of Hull House in Chicago, was a social activist and writer associated with this group. Among the many graduates of Chicago who were influenced by pragmatism during Dewey's time there, several were pragmatists in their own right: Simon F. MacLennan (Ph.D. Chicago 1896, professor at Oberlin College), Ernest Carroll Moore (Ph.D. Chicago 1898, professor at University of California, Berkeley) Arthur K. Rogers (Ph.D. Chicago 1899, professor at Yale University), Ella Flagg Young (Ph.D. Chicago 1900, professor of pedagogy, University of Chicago), H. Heath Bawden (Ph.D Chicago 1900, professor at Vassar College and University of Cincinnati), Henry W. Stuart (Ph.D. Chicago 1900, professor at Stanford University), Irving E. Miller (Ph.D. Chicago 1904, Professor of Psychology and Pedagogy, State Normal School of Wisconsin), Irving King (Ph.D. Chicago 1905, professor of religion, State University of Iowa), and William K. Wright (Ph.D. Chicago 1906, professor at Dartmouth University). Closely associated with Dewey in his retirement years was Arthur F. Bentley, who had attended two of Dewey's courses on logic and ethics while both of them were teaching at Chicago in the late 1890s. Years later their convergent views resulted in a collaborative effort, Knowing and the Known (1949). Under the leadership of department chair James Tufts, the Chicago School continued to produce pragmatic philosophers long after Dewey had left for Columbia in 1904. These include Matilda Castro (Ph.D. Chicago 1907, professor of philosophy and education at Bryn Mawr College), Anna L. Strong (Ph.D. Chicago 1908), Douglas C. Macintosh (Ph.D. Chicago 1909, professor at Yale University), Frederick G. Henke (Ph.D. Chicago 1910, professor at Alleghany College), Ernest L. Talbert (Ph.D. Chicago 1910), Ellsworth Faris (Ph.D. Chicago 1914, professor of sociology at Chicago), George Counts (Ph.D. Chicago 1916, professor at Columbia University Teachers College), Joseph R. Geiger (Ph.D. Chicago 1916, professor at Antioch College), Clarence E. Ayres (Ph.D. Chicago 1917, professor of economics at Chicago and University of Texas), Jacob R. Kantor (Ph.D. Chicago 1917, professor of psychology, Indiana University), Edwin T. Mitchell (Ph.D. Chicago 1922, professor at University of Texas), and Thomas V. Smith (Ph.D. Chicago 1922, professor at Chicago). Mead exerted considerable influence in sociology. Two of his students, Ellsworth Faris and Herbert Blumer, continued his work. 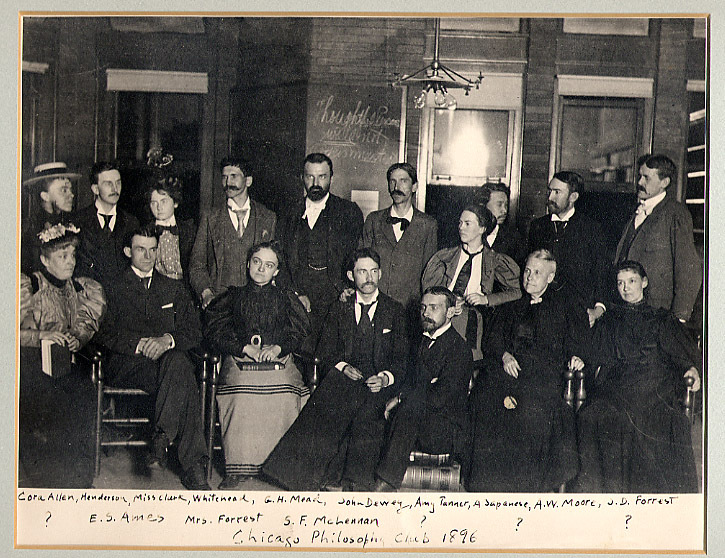 Other sociologists at Chicago, especially W. I. Thomas and Robert Park, who with Mead, Faris, and Blumer could be loosely identified as the "Chicago School of Sociology," shared some common outlooks on the nature and purpose of sociology. Another prominent pragmatist sociologist who shared many of the Chicago School's principles was Charles Horton Cooley at the University of Michigan. For an overview of the place of the Chicago School in the history of American sociology, see "American Trends" by Lewis Coser in A History of Sociological Analysis (1979). Pragmatic themes can also be seen in the work of Thorstein Veblen, Frank H. Knight, and the "Chicago School of Economics." The "Chicago School of Theology" was another manifestation of the enormous influence of James and Dewey. Professors of religion and theology during 1900-1930 that formulated pragmatic standpoints towards religion were Edward Scribner Ames, George Burman Foster, Shirley Jackson Case, Gerald Birney Smith, and Shailer Mathews. Moore died in 1930, Mead died in 1931, and the other original Chicago pragmatists were scattered by department strife. The most prominent pragmatist at Chicago in later years was Charles W. Morris (Ph.D. Chicago 1925, professor at Chicago), who advanced semiotics and his own "neo-pragmatism" which sought cohesion with the new logical empiricism. Charles Hartshorne (Ph.D. Harvard 1928) joined the department in 1928. One of his students, Richard Rorty (M.A. Chicago 1952, Ph.D. Yale 1956, professor at Princeton, Virginia, and Stanford), became a renowned pragmatist. Other pragmatists from Chicago include Donald A. Piatt (Ph.D. Chicago 1925, professor at University of California, Los Angeles), Theodore T. Lafferty (Ph.D. Chicago 1928, professor at University of South Carolina), Wayne A. R. Leys (Ph.D. Chicago 1930, professor at Southern Illinois University), Leslie M. Pape (Ph.D. Chicago 1930), George V. Gentry (Ph.D. Chicago 1931, professor at University of Texas), David L. Miller (Ph.D. Chicago 1932, professor at University of Texas), Stephen S. White (Ph.D. Chicago 1938, professor at Olivet Nazarene College), Ricardo R. Pascual (Ph.D. Chicago 1939, professor at Bradley University), Manley H. Thompson (Ph.D. Chicago 1942, professor at University of Chicago), Knox C. Hill (Ph.D. Chicago 1954, professor at University of Chicago), Darnell Rucker (Ph.D. Chicago 1957, professor at Colorado College), S. Morris Eames (Ph.D. Chicago 1958, professor at Southern Illinois University), Joseph J. Zeman (Ph.D. Chicago 1964, professor at University of Florida), King J. Dykeman (Ph.D. Chicago 1969, professor at Fairfield University), J. Wesley Robbins (Ph.D. Chicago 1969, professor at Indiana University South Bend), Joseph M. Betz (Ph.D. Chicago 1973, professor at Villanova University), and Mark L. Johnson (Ph.D. Chicago 1977, professor at University of Oregon). Since the retirements of Manley Thompson and Knox Hill, American philosophy was occasionally taught by Charles Larmore during the 1980s and 1990s. The arrival of James Conant (Ph.D. Harvard 1991) in 1999 brought a second scholar knowledgeable about pragmatism to the Chicago faculty. John Dewey joined a diverse philosophy department at Columbia University in 1905. His closest allies were the naturalists, Frederick J. E. Woodbridge, William P. Montague, and Wendell T. Bush, and later on John J. Coss (M.A. Columbia 1910). Many Columbia graduate students went on to become members of the American Naturalism movement, and several became committed pragmatists as well. During the first ten years of Dewey's career at Columbia, a handful of graduates were drawn towards pragmatism, including Savilla A. Elkus (Ph.D. Columbia 1907, professor at Vassar College and Smith College), William Forbes Cooley (Ph.D. Columbia 1909), Willystine Goodsell (Ph.D. Columbia 1910, professor at Columbia Teachers College), and Matthew T. McClure (Ph.D. Columbia 1912, professor at Tulane University and University of Illinois). During Dewey's later years of active teaching, three pragmatic naturalists graduated from Columbia and subsequently joined the philosophy department: Herbert W. Schneider (Ph.D. Columbia 1917), Irwin Edman (Ph.D. Columbia 1920), and John Herman Randall, Jr. (Ph.D. Columbia 1922). Other pragmatists trained at Columbia in this period include Will Durant (Ph.D. Columbia 1917), Donald S. Mackay (Ph.D Columbia 1924, professor at University of California, Berkeley), Sidney Hook (Ph.D. Columbia 1927, professor at New York University), Gail Kennedy (Ph.D. Columbia 1928, professor at Amherst College), Ernest Nagel (Ph.D. Columbia 1930, professor at Columbia), Joseph Ratner (Ph.D. Columbia 1930), Sidney Ratner (M.A. Columbia 1931, professor of History at Rutgers), Abraham Edel (Ph.D. Columbia 1934, professor at City College, City University of New York, and presently Research Professor at University of Pennsylvania), John M. Brewster (Ph.D. Columbia 1937), and Justus Buchler (Ph.D. Columbia 1939, professor at Columbia until 1971, and SUNY at Stony Brook until 1981). John Dewey's profound influence on philosophy of education continued through Columbia University's Teachers College. Many of its faculty were Deweyan pragmatists. They included some who were Dewey's students: William Heard Kilpatrick (Ph.D. Columbia 1911), Edward H. Reisner (Ph.D. Columbia 1915), Issac L. Kandel (Ph.D. Columbia 1919), John L. Childs (Ph.D. Columbia 1930), and George R. Geiger (Ph.D. Columbia 1931, also professor of philosophy at Antioch College). Others had become sympathetic to Dewey's views, particularly Harold Rugg (Ph.D. University of Illinois 1915), George Counts (Ph.D. Chicago 1916), and Jesse Newlon. While never a faculty member of the Teachers College, Ohio State University professor Boyd H. Bode was a pragmatic supporter of Deweyan progressive education. Bode worked in close concert with Dewey, Kilpatrick, and Childs on many publishing projects. While he leavened progressive education with his own unique views, Bode counted among the inner circle of Deweyans. Besides education, pragmatism was also well-represented in the field of sociology, where C. Wright Mills (Ph.D. University of Wisconsin 1942) taught from the 1940s until his death in 1962. After Dewey and his original colleagues had retired, the Columbia department led by Herbert Schneider, John H. Randall, Jr., and Ernest Nagel (the first John Dewey Professor of Philosophy) continued to train a third generation of philosophers sympathetic with pragmatism throughout the 1940s, 1950s and 1960s. These philosophers include: Ralph G. Ross (Ph.D. Columbia 1940, professor at University of Minnesota and Claremont Graduate School), Joseph L. Blau (Ph.D. Columbia 1944, professor at Columbia), John E. Smith (Ph.D. Columbia 1948, professor at Yale University), Frederic H. Young (Ph.D. Columbia 1951, professor of English at Monclair State College), H. Standish Thayer (Ph.D. Columbia 1952, professor at City College, City University of New York), Paul W. Kurtz (Ph.D. Columbia 1952, professor at State University of New York at Buffalo), Joseph Margolis (Ph.D. Columbia 1953, professor at Temple University), John Peter Anton (Ph.D. Columbia 1954, professor at Buffalo, Emory, South Florida), Ralph W. Sleeper (Ph.D. Columbia 1956, professor at Queens College, City University of New York), Victorino Tejera (Ph.D. Columbia 1956, professor at State University of New York at Stony Brook), Isaac Levi (Ph.D. Columbia 1957, professor at Columbia), William J. Callaghan (PhD Columbia 1958, professor at Michigan State), John R. Burr, (Ph.D. Columbia 1959, professor at University of Wisconsin, Oshkosh), Thomas R. Martland (Ph.D. Columbia 1959, professor at State University of New York at Albany), Milton Mayeroff (Ph.D. Columbia 1961, professor at State University of New York College at Cortland), Steven D. Ross (Ph.D. Columbia 1961, professor at State University of New York at Binghamton), David Sidorsky (PhD Columbia 1962, professor at Columbia), Donald A. Crosby (Ph.D. Columbia 1963, professor at Colorado State University), Emmanuel G. Mesthene (Ph.D. Columbia 1963, The Rand Corporation), Douglas Greenlee (Ph.D. Columbia 1964, professor at Temple University), Peter H. Hare (Ph.D. Columbia 1965, professor at State University of New York at Buffalo), Steven M. Cahn (Ph.D. Columbia 1966, professor at City College, City University of New York), Joseph M. Ransdell (Ph.D. Columbia 1966, professor at University of California at Santa Barbara and Texas Tech University), Beth J. Singer (Ph.D. Columbia 1967, professor at Brooklyn College, City University of New York), and James Gouinlock (Ph.D. Columbia 1969, professor at Emory University). Sidney Morgenbesser (Ph.D. University of Pennsylvania 1956, the second John Dewey Professor of Philosophy), Isaac Levi (Ph.D. Columbia 1957, the third John Dewey Professor of Philosophy), and David Sidorsky (PhD Columbia 1962) maintained the pragmatic tradition at Columbia University for a fourth generation. Graduates from the 1970s and 1980s include: Roland W. Garrett (Ph.D. Columbia 1970, professor at Montclair State University), Gary M. Shapiro (Ph.D. Columbia 1970, professor at University of Richmond), Naomi Zack (Ph.D. Columbia 1970, professor at State University of New York at Albany and the University of Oregon), Steven C. Rockefeller (Ph.D. Columbia 1973, professor at Middlebury College), Mary Wiseman (Ph.D. Columbia 1974, professor at Brooklyn College, City University of New York), and Hector J. Huyke (Ph.D. Columbia 1987, professor at University of Puerto Rico). Philip Kitcher (PhD Princeton 1974, the fourth John Dewey Professor of Philosophy) is now the prominent pragmatist on the Columbia faculty. New York City is home to four other universities with long traditions of hospitality to pragmatism. In order of the arrival of a pragmatist on the philosophy staff, they are: The New School for Social Research, City University of New York, New York University, and Fordham University. Soon after graduating from Harvard in 1908, Horace M. Kallen joined the faculty of philosophy at the University of Wisconsin, joining two other pragmatically-minded colleagues: Max C. Otto and V. T. Thayer. In 1918 he resigned, protesting the university's disdain for academic freedom. In 1919 Kallen was invited to join the faculty founding the New School for Social Research, where he taught until his death in 1974. He was a pioneer in the cultural pluralism and American Zionism movements, and very active in numerous civil rights and civil liberties issues. Rueben Abel (Ph.D. New School 1952) was a member of the faculty for many years. Graduates include Elizabeth Minnich (Ph.D. New School 1977, professor at Union Institute), and James J. Liszka (Ph.D. New School 1978, professor at University of Alaska, Anchorage). After Abel's retirement Richard J. Bernstein (Ph.D. Yale 1958) joined the faculty in 1989 and became the representative of pragmatism on the philosophy faculty. CUNY has been a home to many pragmatists. Joseph Ratner (Ph.D. Columbia 1929) taught at City College from 1922-1924 and from 1930 into the 1940s. Milton K. Munitz (Ph.D. Columbia University 1939) taught at City College in the early 1940s before joining the faculty of New York University. In 1933 City College welcomed Philip P. Wiener (Ph.D. University of Southern California at Berkeley 1931, professor at City College CUNY and Temple University), followed in 1934 by Abraham Edel (Ph.D. Columbia University 1934, professor at City College, CUNY; presently Research Professor at University of Pennsylvania). Subsequently joining them was H. Standish Thayer (Ph.D. Columbia University 1952, professor at City College, CUNY). Two other colleges of CUNY have been home to pragmatists. Ralph Sleeper (Ph.D. Columbia University 1956) taught at Queens College for three decades, as did Eugene Fontinell (Ph.D. Fordham University 1957), Peter T. Manicas (Ph.D. State University of New York at Buffalo 1963, presently professor of sociology at the University of Hawaii, Manoa), and Gerald E. Myers (Ph.D. Brown University 1954). Additionally, John J. McDermott (Ph.D. Fordham 1959, presently at Texas A&M University) was a member of the faculty in the 1960s and 1970s. Brooklyn College has recently seen the retirement of Gertrude Ezorsky (Ph.D. New York University 1961), Beth J. Singer (Ph.D. Columbia University 1967), and Mary Wiseman (Ph.D. Columbia University 1974). There are presently no pragmatists on the philosophy faculty of any of the four main colleges of CUNY, although courses on American philosophy are occasionally taught, recently by Steven Cahn (Ph.D. Columbia 1966). Sidney Hook (Ph.D. Columbia 1927) joined New York University as an Instructor in 1927. From 1948 until his retirement in 1969 Hook was the Head of the Philosophy Department, and he was Emeritus Professor at NYU until his death in 1989. Milton K. Munitz (Ph.D. Columbia University 1939) also taught American philosophy at NYU for decades. Many pragmatists began their graduate studies under Hook, with some transferring to obtain the Ph.D. at Columbia University. Among those who graduated from NYU working on pragmatism are Gertrude Ezorsky (Ph.D. NYU 1961, professor at Brooklyn College, City University of New York), Richard Gale (Ph.D. NYU 1961, professor at University of Pittsburgh), Bruce Wilshire (Ph.D. NYU 1966, professor at Rutgers University), and Joseph L. Esposito (Ph.D. NYU 1970, professor at Bradley University and Texas Tech University). Pragmatism has not been consistently offered at the graduate level for some time. American philosophy and pragmatism has been taught at Fordham University for many decades, as evidenced by the department's periodic production of graduates working in pragmatism. These include Gertrude A. Trageser (Ph.D. Fordham 1934); Mary L. Brady (Ph.D. Fordham 1945); Beatrice H. Zedler (Ph.D. Fordham 1947, professor at Marquette University), Eugene Fontinell (Ph.D. Fordham 1957, professor at Queens College, CUNY); John J. McDermott (Ph.D. Fordham 1959, professor at Queens College, CUNY and Texas A&M University); and Robert M. Barry (Ph.D. Fordham 1963, professor at Loyola University, Chicago). In the 1960s three pragmatists joined the faculty: Anton E. Donoso (Ph.D. University of Toronto 1960, who later went to the University of Detroit), Robert J. Roth (Ph.D. Fordham 1961), and Vincent Potter (Ph.D. Yale 1965). They inaugurated a solid tradition of producing numerous graduates working in pragmatism. Graduates include Peter T. Turley (Ph.D. Fordham 1967, professor at Georgetown University), Paul Nagy (Ph.D. Fordham 1968, professor at Indiana University-Purdue University Indianapolis), William J. Gavin (Ph.D. Fordham 1970, professor at University of Southern Maine), Elizabeth Kraus (Ph.D. Fordham 1970, professor at Fordham University), James E. Giles (Ph.D. Fordham 1971, professor at Iona College), Stanley M. Harrison (Ph.D. Fordham 1971, professor at Marquette University), William Kiernan (Ph.D. Fordham 1974, professor at St. Peter's College), Lee T. Oei (Ph.D. Fordham 1974, professor at Saint Francis College), Gerard Vallone (Ph.D Fordham 1979, professor at Pace University), E. Paul Colella (Ph.D. Fordham 1981, professor at Xavier University), Alexander Eodice (Ph.D. Fordham 1987, professor at Iona College), and Kenneth J. Rudnick (Ph.D. Fordham 1990, professor at Gonzaga University and St. John's Seminary College). Professors who work in pragmatism on the faculty at Fordham currently are Judith Greene (Ph.D. University of Minnesota 1987) and Judith Jones (Ph.D. Emory University 1993). The tradition of pluralism at Boston University has long nurtured the study of American philosophy in general and pragmatism in particular. While no pragmatist served on the faculty until recent decades, many graduates wrote dissertations on pragmatism, including William W. Shenk (Ph.D. Boston University 1905), Bertram J. Morris (Ph.D. Boston University 1908), George B. Thomas (Ph.D. Boston University 1913), Yu-Shan Han (Ph.D. Boston University 1929), Jannette E. Newhall (Ph.D. Boston University 1931), Leroy Loemker (Ph.D. Boston University 1931, professor at Emory University), Edward T. Ramsdell (Ph.D. Boston University 1932, professor of theology at Vanderbilt University), Sadhu S. Dhami (Ph.D. Boston University 1937), Francis G. Ensley (Ph.D. Boston University 1939), Warren C. Young (Ph.D. Boston University 1946), William J. MacLeod (Ph.D. Boston University 1948, professor at Baldwin-Wallace College). From the 1950s into the 1970s, faculty members Yeager Hudson and Richard Millard encouraged the study of American philosophy, and Leroy Rouner (Ph.D. Columbia University 1961) taught American philosophy from the late 1960s to the early 2000s. Graduates with interests in pragmatism from that time include Ralph L. Ruhlen (Ph.D. Boston University 1959, professor at Baker University), Joseph H. Wellbank (Ph.D. Boston University 1965, professor at Northeastern University), Richard A. DeCesare (Ph.D. Boston University 1968, professor at Massachusetts State College at Fitchburg). More recently, Victor Kestenbaum (Ed.D. Rutgers University 1972) and Robert C. Neville (Ph.D. Yale University 1963) have taught American philosophy. Their graduates include Michael S. Berliner (Ph.D. Boston University 1971, professor at California State University at Northridge), Owen Flanagan (Ph.D. Boston University 1977, professor at Duke University), and James F. Bohman (Ph.D. Boston University 1985, professor at St. Louis University). Yale University is second only to Columbia University for producing graduates who have had prominent scholarly careers in pragmatism. Douglas C. Macintosh (Ph.D. University of Chicago 1909) expounded a version of pragmatism as professor of theology and philosophy of religion from 1909 into the 1940s. Yale graduates writing on pragmatism from that time include Herbert P. Patterson (Ph.D. Yale 1913), Albert L. Scales (Ph.D. Yale 1917), Julius S. Bixler (Ph.D. Yale 1924, professor of theology at Harvard University), Eugene T. Adams (Ph.D. Yale 1934), and Henry C. Sprinkle (Ph.D. Yale 1929). The 1950s brought a renaissance of interest in American philosophy and pragmatism at Yale, when Paul Weiss (Ph.D. Harvard 1929) and John E. Smith (Ph.D. Columbia 1948) joined the department. Their students included Irwin C. Lieb (Ph.D. Yale 1953, professor at University of Texas), Murray G. Murphey (Ph.D. Yale 1954, professor of history at University of Pennsylvania), Andrew Reck (Ph.D. Yale 1954, professor at Tulane University), Richard Rorty (Ph.D. Yale 1956, professor at Princeton, Virginia, and Stanford), Richard J. Bernstein (Ph.D. Yale 1958, professor at The New School for Social Research), Max O. Hocutt (Ph.D. Yale 1960, professor at University of Alabama), Garrett M. Brodsky (Ph.D. Yale 1961, professor at University of Connecticutt), John Lachs (Ph.D. Yale 1961, professor at Vanderbilt University), Donald S. Lee (Ph.D. Yale 1961, professor at Tulane University), Robert C. Neville (Ph.D. Yale 1963, professor at Boston University), Vincent G. Potter (Ph.D. Yale 1965, professor at Fordham University), B. Gresham Riley (Ph.D. Yale 1965, professor at New College, Florida), Gary A. Cook (Ph.D. Yale 1966, professor at Beloit College), F. Wright Neely (Ph.D. Yale 1967, professor at University of Illinois), John K. Roth (Ph.D. Yale 1967, professor at Claremont McKenna College), Peter Limper (Ph.D. Yale 1975, professor at Christian Brothers University), Lorenzo C. Simpson (Ph.D. Yale 1978, professor at SUNY Stony Brook), and Peter Ochs (Ph.D. Yale 1980, professor of religion at University of Virginia), and Mark H. Migotti (Ph.D. Yale 1991, professor at University of Calgary). After John E. Smith's retirement, there is no representative of American philosophy at Yale University. The University of Pennsylvania was an early center for the study of American philosophy. Edgar A. Singer (Ph.D. Harvard 1894) studies philosophy and psychology with William James, and taught modern philosophy, psychology, and pragmatism at Penn. Singer's most prominent student was C. West Churchman (Ph.D. Pennsylvania 1938, professor at Pennsylvania, Case Institute, and UC Berkeley) who pioneered a pragmatist approach to systems theory. Another student, Elizabeth Flower (Ph.D. Pennsylvania 1939, professor at Pennsylvania), became one of the foremost experts on American thought. Flower and Murray G. Murphey (Ph.D. Yale University 1954, professor of history at Pennsylvania) authored the two-volume A History of Philosophy in America. Graduates include Sheldon Peterfreund (Ph.D. Pennsylvania 1948, professor at Syracuse University), Israel Scheffler (Ph.D. Pennsylvania 1952, professor at Harvard University), Sidney Morgenbesser (Ph.D. Pennsylvania 1956, professor at Columbia University), and John W. Sweigart, Jr. (Ph.D. Pennsylvania 1959, professor at Madison College), Thomas W. Platt (Ph.D. Pennsylvania, 1967, professor at West Chester University), and Robert F. Almeder (Ph.D. Pennsylvania 1968, professor at Georgia State University). Bruce R. Kuklick (Ph.D. Pennsylvania 1968, professor of history at Pennsylvania) joined Flower and Murphey to establish an unparalleled combination of philosophical and historical perspectives on American thought. This alliance was enhanced with the later arrival of Flower's husband, Abraham Edel (Ph.D. Columbia University 1934, professor at City College of CUNY) who after retirement in 1973 became Research Professor of Philosophy at Pennsylvania. More recent graduates include Emily P. Michael (Ph.D. Pennsylvania 1973, professor at Brooklyn College of CUNY), Vincent L. Luizzi (Ph.D. Pennsylvania 1973, professor at Southwest Texas State University), Andrew Feffer (Ph.D. in History at Pennsylvania, professor at Union College), Mark S. Mendell (Ph.D. Pennsylvania 1989, professor at Long Island University), and Casey Haskins (Ph.D. Pennsylvania 1989, professor at Purchase College, State University of New York). Courses in American philosophy have not been offered by the philosophy department for many years. The University of Wisconsin has long been an important center for the study of pragmatism. Horace M. Kallen (Ph.D. Harvard 1908) taught there from 1911 to 1918, before moving to The New School for Social Research. Max C. Otto (Ph.D. University of Wisconsin 1911) was a significant defender of pragmatism at Wisconsin from the 1910s to the 1960s. Vivian T. Thayer (Ph.D. University of Wisconsin 1922) taught a pragmatic philosophy of education for several decades. Two more pragmatists on the faculty from the 1930s into the 1960s were Carl M. Bogholt (Ph.D. University of Wisconsin 1933) and Horace S. Fries (Ph.D. University of Wisconsin 1934). Graduates in pragmatism include Stephen L. Ely (Ph.D. University of Wisconsin 1938), Walker H. Hill (Ph.D. University of Wisconsin 1938, professor of education at University of Chicago), Francis M. Myers (Ph.D. University of Wisconsin 1944, professor at University of Denver), Clifford W. Anderberg (Ph.D. University of Wisconsin 1953, professor at University of Omaha), and Arthur M. Wheeler (Ph.D. University of Wisconsin 1958, professor at Kent State University). Another prominent pragmatist from Wisconsin is C. Wright Mills (Ph.D. University of Wisconsin 1942, professor of sociology at Columbia University). Mills received his M.A. in philosophy at the University of Texas, while George Gentry and David Miller were on the faculty, and wrote his dissertation on "A Sociological Account of Pragmatism" in Wisconsin's sociology department. Marcus G. Singer (Ph.D. Cornell University 1952) has taught American philosophy and pragmatism at Wisconsin from the 1950s on, and is presently Emeritus Professor. His students include Georges Dicker (Ph.D. University of Wisconsin 1969, professor at State University of New York College at Brockport), and Ellen Kappy Suckiel (Ph.D. University of Wisconsin 1972, professor at University of California, Santa Cruz). The University of Illinois has long been a haven for the study of American philosophy and home to many pragmatists. Boyd H. Bode (Ph.D. Cornell 1900) was hired in 1909 and served on the philosophy staff until his move to Ohio State in 1921. Among his graduate students working in pragmatism were Denton L. Geyer (Ph.D. University of Illinois 1914, professor at Chicago Teachers College) and Ethel E. Sabine (Ph.D. University of Illinois 1916, professor at Mills College). Upon Bode's departure, Matthew T. McClure arrived (Ph.D. Columbia 1912), who had been heavily influenced by Dewey. McClure first taught at Tulane University from 1915-1921, and then taught at the University of Illinois from 1921 into the 1950s. Another defender of Deweyan pragmatism, Guy A. Tawney (Ph.D. Leipzig 1896) taught at University of Cincinnati from 1908 to 1930, joined the faculty at University of Illinois in 1930, and retired in 1939. Frederick L. Will (Ph.D. Cornell 1937) promulgated a pragmatic realism at Illinois from 1941 into the 1970s. The tradition of American philosophy was also taught by Arthur E. Murphy (Ph.D. University of California, Berkeley 1925), from 1939-1945. The most prominent pragmatist at Illinois was Max H. Fisch (Ph.D. Cornell 1930), who joined the department in the 1940s. Graduates from Illinois during this period include Hubert Kessler (Ph.D. University of Illinois 1940), Lawrence L. Haworth (Ph.D. University of Illinois 1952, professor at University of Waterloo), James R. Gardner (Ph.D. University of Illinois 1953), Eugene F. Kaelin (Ph.D. University of Illinois 1954, professor at Florida State University), Manuel M. Davenport (Ph.D. University of Illinois 1957, professor at Texas A&M University), Bernard H. Suits (Ph.D. University of Illinois 1958, professor at University of Waterloo), Joseph Chambliss (Ed.D. University of Illinois 1959, professor of education at Rutgers University), Jack C. Carloye (Ph.D. University of Illinois 1960, professor at Washington State University), Don D. Roberts (Ph.D. University of Illinois 1963, professor at University of Waterloo), Jarrett E. Brock (Ph.D. University of Illinois 1969, professor at San Jose State University), Donald R. Koehn (Ph.D. University of Illinois 1969, professor at Illinois Wesleyan University), Willard M. Miller (Ph.D. University of Illinois 1969, professor at University of Vermont), Richard W. Miller (Ph.D. University of Illinois 1970, professor at University of Missouri, Rolla), David E. Pfeifer (Ph.D. University of Illinois 1971, professor at Principia College), and H. William Davenport (Ph.D. University of Illinois 1977, professor at Western Illinois University). F. Wright Neely (Ph.D. Yale University 1967) taught American philosophy for many years. Among current faculty, Stephen Wagner (Ph.D. Princeton 1978) includes pragmatism in his research interests. The tradition of American philosophy was inaugurated at the University of Texas at an early date. Edwin T. Mitchell (Ph.D. University of Chicago 1923) was imbued with the functionalist spirit of pragmatism taught at Chicago. After Mitchell joined the University of Texas faculty in 1923, two more products of Chicago arrived in the early 1930s: George V. Gentry (Ph.D. University of Chicago 1931) and David L. Miller (Ph.D. University of Chicago 1932). During Miller's tenure of leadership in the department, American philosophy prospered. Arthur E. Murphy (Ph.D. University of California, Berkeley 1925) taught from 1958 to 1962. Charles Hartshorne (Ph.D. Harvard 1923) and Irwin C. Lieb (Ph.D. Yale 1953) arrived in the mid-1960s. Among the graduates working in pragmatism were Minor W. Boyer (Ph.D. Texas 1953), Robert E. Robertson (Ph.D. Texas 1953, professor at Ball State University), Wendell T. Howard (Ph.D. Texas 1955, professor at University of Houston), Peter C. Appleby (Ph.D. Texas 1963, professor at University of Utah), Arthur W. Skidmore, III (Ph.D. Texas 1968, professor at University of Kansas), Lucius R. Eastman, Jr. (Ph.D. Texas 1969, professor at San Jose State University), Roger P. Fendrich (Ph.D. Texas 1971, professor at Beloit College), Larry A. Hickman (Ph.D. Texas 1971, professor at Southern Illinois University at Carbondale), Kenneth C. Chandler (Ph.D. Texas 1973, professor at University of Missouri), Michael P. Jones (Ph.D. Texas 1973, professor at Western Carolina University), Roger J. Sullivan (Ph.D. Texas 1973, professor at University of South Carolina), James R. Hamilton (Ph.D. Texas 1974, professor at Kansas State University), Thomas L. Short (Ph.D. Texas 1974), and Kenneth Winkler (Ph.D. Texas 1977, professor at Yale University). Recent graduates include Gregory Fernando Pappas (Ph.D. Texas 1990, professor at Texas A&M University), William H. Gibson (Ph.D. Texas 1994, professor at United States Air Force Academy), William T. Myers (Ph.D. Texas 1996, professor at Birmingham-Southern College), and David L. Hildebrand (Ph.D. Texas 1997, instructor at University of Memphis). G. Douglas Browning (Ph.D. Texas 1958) taught pragmatism for many years, but he is now retired. The University of Toronto's pluralistic tradition includes American philosophy and pragmatism. George S. Brett taught the history of American philosophy and psychology from the 1920s to 1940s. Toronto's first graduate in pragmatism, Thomas A. Goudge (Ph.D. Toronto 1937) was selected in 1938 by Brett to inauguate the graduate teaching of logic, pragmatism, and positivism. From that time until his retirement in 1976, Goudge was the primary force enlarging the department, and with David Savan (M.A. Harvard 1938), developing its graduates in American philosophy. Among these graduates are Marcus Long (Ph.D. Toronto 1940), Sidney Dillick (Ph.D. Toronto 1942), Frank M. Doan (Ph.D. Toronto 1952, professor at Lakehead University), Robert H. Vingoe (Ph.D. Toronto 1953, professor at Dalhousie University), William J. Huggett (Ph.D. Toronto 1954, professor at University of Toronto at Scarborough), Eric D. McCormack (Ph.D. Toronto 1958), Anton E. Donoso (Ph.D. Toronto 1960, professor at Fordham University and University of Detroit), Donald MacMillan (Ph.D. Toronto 1962), Ignas K. Skrupskelis (Ph.D. Toronto 1967, professor at University of South Carolina), Robert E. Carter (Ph.D. Toronto 1969), and Paul T. O'Leary (Ph.D. Toronto 1973, professor at University of Western Ontario). Jacqueline Brunning (Ph.D. Toronto 1981) taught pragmatism until recently. Among current faculty at Toronto, Cheryl Misak (D.Phil Oxford University 1988) and Joseph Heath (Ph.D Northwestern) include pragmatism among their interests. The State University of New York at Buffalo became a respected pluralistic department under the leadership of Marvin Farber (Ph.D. Harvard 1925). While he was professor of philosophy at Buffalo from 1927 to 1974, Farber encouraged a philosophical environment favorable towards phenomenology, naturalism, and pragmatism. One of his students was Wilfrid Sellars who earned an M.A. in philosophy from Buffalo in 1934. During the philosophy department's dramatic expansion in the 1960s, three additions to the faculty were graduates of Columbia University who all advocated pragmatic naturalism. John Peter Anton (Ph.D. Columbia University 1954) was professor of philosophy from 1962 to 1969. Paul Kurtz (Ph.D. Columbia University 1952) was professor of philosophy from 1965 to 1991, when he founded the Center for Inquiry in Buffalo. Peter H. Hare (Ph.D. Columbia University, 1965) was professor of philosophy from from the late 1960s until retiring in 2001. Joining them was another scholar of naturalism and the history of American philosophy, Edward H. Madden (Ph.D. University of Iowa, 1950), who was professor of philosophy from 1964 to 1980. During the 1970s, 1980s, and 1990s the University of Buffalo was an outstanding place to study pragmatic naturalism and the history of American philosophy, maintaining the tradition of the Columbia School of Naturalism and Pragmatism. Among Buffalo's graduates are Arnold Berleant (Ph.D. Buffalo 1962, professor at Long Island University), John Lincourt (Ph.D. Buffalo 1972, professor at University of North Carolina at Charlotte), Peter Kauber (Ph.D. Buffalo 1972, professor at Bowling Green University), Philip M. Zeltner (Ph.D. Buffalo 1974, professor at South Carolina), Lesley Friedman (Ph.D. Buffalo 1994, professor at Lynchburg College), John R. Shook (Ph.D. Buffalo 1994, professor at Oklahoma State University 2000-2006, now senior research fellow at the Center for Inquiry in Buffalo), and Berit Brogaard (Ph.D. Buffalo 2000, professor at University of Missouri, St. Louis). Randall R. Dipert (Ph.D. Indiana University, 1978) joined the faculty as Charles S. Peirce Professor of American Philosophy in 2000. Pennsylvania State University abruptly became a haven for American philosophy and pragmatism with the arrival of two scholars, Carl Hausman and Carl Vaught, in the late 1960s. Carl Hausman (Ph.D. Northwestern 1960) was professor of philosophy from 1967 to 1993 and produced several outstanding students specializing in Charles Peirce. Carl Vaught (Ph.D. Yale 1966) was professor for thirty-one years (until 1998) where he directed the dissertations of twenty-nine graduate students and served as Head of the department from 1982 to 1992. Two other specialists in pragmatism arrived in the early 1990s and taught at Penn State during the 1990s and early 2000s: Douglas Anderson (Ph.D. Penn State 1984) was a professor from 1990 to 2005; and John Stuhr (Ph.D. Vanderbilt 1976) was a professor at Penn State from 1994 to 2004. Graduates of Penn State include Joseph DeMarco (Ph.D. Penn State 1969, professor at Cleveland State University), John Peterman (Ph.D. Penn State 1980, professor at William Patterson University), Patricia Turrisi (Ph.D. Penn State 1986, professor at University of North Carolina, Wilmington), Feliecia Kruse (Ph.D. Penn State 1989, professor at Xavier University), Roger Ward (Ph.D. Penn State 1996, professor at Georgetown College), James Pawelski (Ph.D. Penn State 1997, professor at University of Pennsylvania), and Thomas Hilde (Ph.D. Penn State 2002, professor at University of Maryland). Current faculty whose interests include pragmatism are Vincent Colapietro (Ph.D. Marquette 1983) and Shannon Sullivan (Ph.D. Vanderbilt 1994). SUNY at Stony Brook's philosophy department has been an excellent place for the study of American philosophy and pragmatism since the 1960s. Victorino Tejera (Ph.D. Columbia 1956) was a professor of philosophy and humanities from the 1960s until the late 1990s. Justus Buchler (Ph.D. Columbia 1938) was a professor from 1971 until his semi-retirement in 1981, and he continued to advise students until his death in 1991. Robert Neville (Ph.D. Yale 1963) was a professor in the department from 1978 to 1987. During the 1970s and 1980s, Stony Brook produced many excellent scholars on the history of American philosophy and pragmatism. Prominent graduates include James Campbell (Ph.D. Stony Brook 1979, professor at University of Toldeo), Steve Odin (Ph.D. Stony Brook 1980, professor at Hawaii), Marjorie Miller (Ph.D. Stony Brook 1980, professor at SUNY Purchase), John Ryder (Ph.D. Stony Brook 1982, professor at SUNY Cortland), Armen Marsoobian (Ph.D. Stony Brook 1984, professor at Southern Connecticut State University), Richard Hart (Ph.D. Stony Brook 1984, professor at Bloomfield College), and Lawrence Cahoone (Ph.D. Stony Brook 1985, professor at Boston University and College of the Holy Cross). Current faculty whose interests include pragmatism are Lorenzo Simpson (Ph.D. Yale 1978) and Harvey Cormier (Ph.D. Harvard 1992).